I love it when new places open in Kigali that feel like a lot of time and care has gone into getting things up and running. Too often it seems like new restaurants open without any creative flare in the decor and, more importantly, without much care taken to train their staff. The Hut is one of those rare places has put in a huge effort in both of these areas and it really shows. he Hut has been specifically built as a boutique hotel with a pool and restaurant. It has a wonderful space for dining beneath a… well… hut, I suppose. Makes sense. The pool (Rwf 4,000 for adults, Rwf 2,000 for kids) is located just off to the side and has a fantastic view and would make a great place to hang out for a day sipping cocktails. They also offer a pretty amazing mid-week (10am to 4pm) deal for Rwf 5,000 including pool access, a towel, wifi, a glass of wine or beer, and pizza. Probably the best pool deal in town if you can wrangle some time off mid-week. It’s more of a lounging, splashing pool than a laps pool… but with beer and pizza, who wants to do laps anyway? Not I.
I absolutely love the menu here and I’m always excited to return to try something new. It’s a great mix of grilled meat, seafood, pasta, salads, and even curries. The first time I went I tried the Lebanese Lamb Kofta (Rwf 9,000) which delicious once I figured out that the best way of eating it is to wrap it up in the soft flatbread with a bit of avocado, salsa, and some of the mint yogurt dressing. I love how the food is served, too. The wooden boards are a neat touch and reminds me again that a lot of thought and work has gone into setting this place up. The veggie burger (Rwf 5,000) here is billed as ‘Not a Boring Veggie Burger’ and for the price with two sides included in addition to the burger, it’s great value. I’ve never eaten a veggie burger in my life (true story) but my friend confirmed that it was indeed not boring. One thing I really love about The Hut is the option to choose two sides and a sauce. You can pick from a really broad list of starches (fries, mashed or baked potato, ashed sweet potato or fries, grilled plantains, white or stir fried rice, naan bread, stir fried noodles, couscous, or spiced potato ‘harra’ fries), and the veggie options are equally as enticing (butter sauteed or roasted vegetables, firecracker green beans and mushrooms, roasted nutty stuffed eggplant with buttermilk dressing, sauteed dodo, or Chinese fried vegetables). Throw on a sauce of your choosing (from a list of 16!) and you have a really great value meal suited to your personal tastes. The Hut isn’t just about grilled meat and sauces though, they also have a good selection of seafood that’s flown in regularly from the Kenyan coast. You can choose from a whole lobster (Rwf 58,000), jumbo shrimp (Rwf 28,000), a filet of king fish (Rwf 18,000), and calamari (Rwf 10,000) along with the usual Nile perch brochettes (Rwf 9,000) and a whole tilapia (Rwf 11,000). Pricey, but I imagine the logistics of flying Mr. Lobster to your plate are tricky. Since seafood is so rare in Kigali there’s not a lot to compare the prices to. But if you’re looking to splash out on a nice meal and have a hankering for seafood, The Hut has some good options. 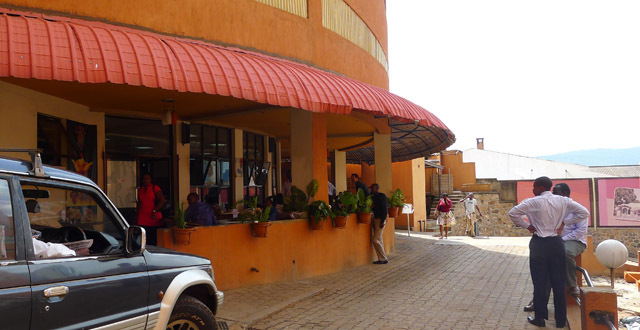 The Hut has a lot of things that you really can’t get anywhere else in Kigali. Well, not that I’ve seen. One stand out is the Loaded Sweet Potato Fries (Rwf 5,000) that not only use actual orange sweet potatoes but they’re also topped with a dollop of sour cream – something that it a very rare find, indeed! If you’re looking for a filling comfort food sort of a meal, these fries will do the trick. I was really impressed with the Caesar salad (Rwf 8,000). the bacon is crispy and plentiful, the dressing is pretty legit, and best of all, the generous piece of chicken served with it has a really nice seasoning on it. For the price it could have done with a bit more lettuce although the stuff that matters (bacon, chicken, and dressing) were all served out in good portions. It might even be a contender for the best Caesar salad in Kigali! Hmm… yet another article I still have to write. One thing I love about this place is the nice extra touches that you wouldn’t expect. The free toasted homemade bread with parsley butter is one of those great little extras that put a smile on my face. Other things like the waiter pulling our table away out of the sun for us before we unknowingly got burned and the attentive but not overzealous wait staff always there to top off your drink are nice little things that I really appreciate. 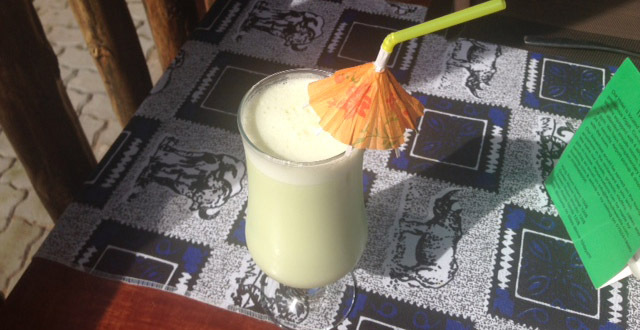 Thai Pinacolada (Rwf 7,000) with the usual pineapple juice, coconut milk, and rum and the extra bonus of Thai basil to really set it apart. I found their cocktail menu pretty intriguing and look forward to working my way through it. Especially interesting were the Pili Pili and Cilantro Frozen Margarita (Rwf 7,000) with tequila, lemon juice, pickled pili pili, and fresh cilantro and the The Hut Sunrise (Rwf 7,000) with vodka, tequila, watermelon, and orange juice. I look forward to coming here some evening soon for sundowners while enjoying the view. The Hut has a really nice bar area a bit of to the side from the dining area. There are a few high tables with a great view, a well-stocked bar with stools, and a couple of pretty sweet leather couches to lounge on. 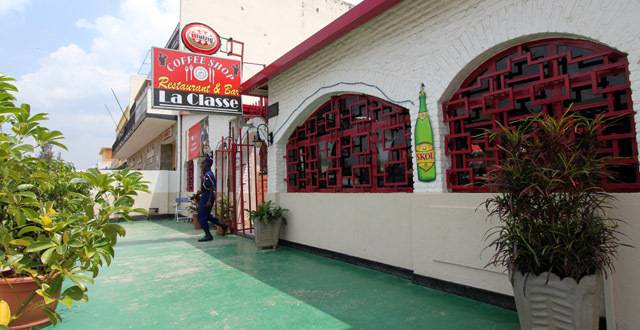 Drinks here are reasonably priced with a glass of house wine for Rwf 3,000 and a good variety of other wines (from a bottle… oh ya!) for between Rwf 5,000 and 7,500 per glass or bottles from Rwf 22,000 to 58,000. They also have sparkling wine (Rwf 25,000 to 39,000) or if you’re feeling like a fancy pants, Champagne (Rwf 100,000 to 130,000). Shots of alcohol start at Rwf 1,800 for Smirnoff and go up from there and beer is between Rwf 1,200 for a small Turbo King or Primus Knowless up to Rwf 2,500 for a Heinekin or Guinness. As far as desserts go, they have an interesting selection to choose from. The Passionfruit and Mint Pannacotta with Red Chili Caramel (Rwf 5,000) is intriguing but since it’s not chocolate, I will probably never order it. For chocolate lovers like me, there’s the Macadamia Nut Chocolate Brownie (Rwf 4,500) or the the Chocolaty Peanuty Butter Fudge Sundae (Rwf 5,000). Republic of Bananas (Rwf 4,500) gets my vote for one of the best dessert names in Kigali (but it can’t beat ‘Young Girl’s Dream’ at Hellenique… nothing can. It’s also the creepiest dessert in the city). Or you can try their homemade ice cream (Rwf three scoops for 3,500) with a choice of vanilla, chocolate, strawberry, caramel, banana, and …mojito!? I really really like this place. It’s great to see a restaurant with some extra effort put in along with a professinal chef who has obviously taken a lot of time and care planning the menu. They’re still pretty new but they’ve already hosted a Thanksgiving meal that was well-received and they have plans for special meals over the holidays as well. The Hut is the real deal and you should check it out immediately. Seriously. Ibtried 2 times the hut and me i was not very impressed. Beef brochettes was good, but the waiters was confused in the huge side list so nobody at the table received the right sides. Personnaly i don’t like huge menu like this because nobody can be good to do curry and pizzas and seafoid and burgers and grill… I mean find your speciality and do it great, but want to please everybody it is not a good idea. You loose people with a so huge menu and you loose the waiters when they take the order. I don’t typically like a big menu at a restaurant either, but what is crazy Jonathan is the hut is actually good at everything that I have tried. I would have to disagree on this remark. Good place to eat. I too love bacon on my Caesar. I also love the panna cotta. I’m a die-hard chocolate fan, but the richness of the chili caramel reminds me of Mexican hot chocolate (without the chocolate of course). Totally worth the adventure.